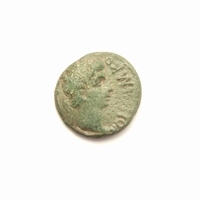 Obverse: FL IVL HE-LENAE AVG, bust right wearing ornamental mantle, hair elaborately dressed. Reverse: PA-X PV-BLICA, Pax standing left holding branch and transverse sceptre, .TRP. in ex. 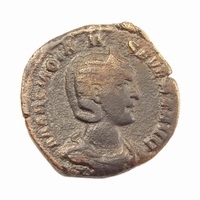 Saint Helena, also known as Saint Helen, Helena Augusta or Helena of Constantinople (ca. 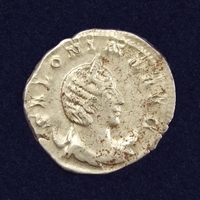 246/50 AD – 18 August 330 AD) was the consort of Emperor Constantius, and the mother of Emperor Constantine the Great. She is traditionally credited with finding the relics of the True Cross, with which she is often represented in Christian iconography.